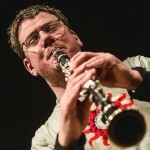 Clarinettist Pete Furniss lives in Edinburgh and has played with many of the UK’s ensembles and orchestras. He is a dedicated improviser and educator and is currently undertaking practice-based doctoral research into live electronic performance at the University of Edinburgh, supported by the AHRC. His work explores the relationships between human presences, machine intervention and considerations of space in live performance, and investigates wider questions about liveness, agency and perception. He gives solo electro-instrumental performances internationally, including collaborations with Martin Parker, Richard Dudas, Michael Edwards and Alex Harker. Pete is a member of Edinburgh’s free improvisation collective edimpro, Not So Silent Movies, Impropera, and a regular guest with Showstoppers and the London Improvisers’ Orchestra. He has also written for, directed and assisted on a wealth of education projects with the DaCapo Foundation, Love Music, SCO Vibe and Tinderbox Orchestra. Recordings include Time Pieces (Clarinet Classics), Samaagam, with members of the SCO and Amjad Ali Khan, a bass clarinet feature on Martin Parker’s gruntCount for sumtone, and both a solo album and duo with guitarist Haftor Medbøe due out in 2015.